With more than 100 million followers on social media and their own TV channel, FC Barcelona are one of the most successful football teams in the world. By the end of 2017, the team had a total of 85 trophies. In Deloitte’s Football Money League, which analyses the highest generating clubs in world football, FC Barcelona comes in at third place. Due to their popularity and success, the Camp Nou stadium has become one of the major tourist attractions in Spain. In this article, I will tell you all about the Camp Nou Experience tour including ticket prices, my own personal experience with a short review, advice on buying match tickets, how to get to Camp Nou, how to pronounce it, the redevelopment of the stadium, facts about the stadium and restaurants at Camp Nou and apartments nearby. At the end of the article, you can download an impressive Camp Nou wallpaper for your desktop! If you are planning to come to see a match or to visit Camp Nou you should consider staying in the Les Corts area. It is very well connected to the city centre and has all kinds of shops, bars and restaurants. Check our offer of holiday rentals in the Camp Nou area. 2.4 Don't stop there, check out Leo Messi's house! 5 Nou Camp or Camp Nou? Camp Nou Facts: The largest stadium in Europe · Second largest association football stadium in the world · Capacity of 99,354 · Record attendance is 120,000 in 1985. In 1898, Swiss sports fanatic Hans Gamper came to Barcelona for work. In 1899, Gamper decided to find other players interested in forming a football team in the city, so placed in advert in Los Deportes sports magazine. Eventually, him and eleven other men from different countries came together to form Fútbol Club Barcelona. His aim was to create a club that would bring people from all origins together which would be freely governed by its members. As a sign of gratitude to Catalonia for welcoming him to the region, Gamper decided that the club would be committed to the Catalan identity, hence the slogan “Més que un club” or “More than a club” in English. Nowadays, the club still represents Gamper’s original values: Catalan identity, democracy and universality. Do you dream about playing for FC Barcelona? For an hour and a half, you can live the life of a Barça player with the Camp Nou Experience. With the chance to walk through the players tunnel to the pitch, see the five European Cups won by the team, to explore the space dedicated to the incredible Leo Messi and more, what are you waiting for? Stadium Tour: Includes a complete Museum and Tour visit, as well as a panoramic view. Stadium Tour Plus: Includes a complete Museum and Tour visit, panoramic view, virtual experience with VR glasses and a multimedia audio guide. Stadium Tour: Tickets start at 20 €, get them here. Stadium Tour Plus: Tickets start at 30 €, get them here. The first tour is at 9:30am and the last tour is at 6pm. I would recommend going as early as possible, as the tour is very popular with school trips so can get very crowded later on in the day. The time it takes to do the tour varies. There is lots of information to read and take in, various memorabilia to admire and videos to watch and interact with, so take your time. There is no time limit, so you could take a leisurely stroll around the museum in two hours or spend the whole morning there. I chose to do the Stadium Tour Plus so that I could learn more about the stadium and club with the audioguide and try out the VR glasses. I will now walk you through the tour, you'll be itching to go by the end! Audioguide: If you opt for the Stadium Tour Plus with the audio guide, you will receive a small mobile device with headphones. As you walk around the museum, you will see various numbers on the wall next to important things to note, which you can type into the device. You will be shown a short video with audio explaining more about what you are seeing. Virtual Reality: For those who have purchased the Stadium Tour Plus, you will have the opportunity to try out the Virtual Reality Experience. Watch historic matches up close and personal through the Virtual Reality Glasses. This experience last around five minutes. As soon as you start walking down the tunnel, members of staff offer to take professional photos of you which you can purchase at the end of the tour as a memory of this incredible experience. Once you’ve had your photo taken, walk into the Camp Nou Museum where you will find all the trophies FC Barcelona have won since they first starting playing, as well as current and previous players' old boots, t-shirts, signed footballs and more. I found this part of the tour very intriguing, I loved looking at the signed memorabilia, especially the players' worn football boots! I spent around an hour in the museum, as there is lots of information to read and lots to see, including 'Espai Messi', where you can view all of his Ballon d'Ors. Next, you will make your way down to the press rooms where the players and coaches are interviewed. You will then move onto the away teams changing rooms, where there are massage tables, showers and a jacuzzi for the players to relax in after a match. Step 3: Stand on the pitch! Then for the best part of the tour: Experience life as a football player by walking down the tunnel and onto the pitch! You can sit on the chairs the coaches sit on to watch the game and appreciate the scale of the stadium. Feel on top of the world as you look over the pitch from the commentators box. After enjoying the view, walk through to the FC Barcelona megastore, where you can buy everything you could ever wish for, including balls of the turf! I loved the tour and would recommend it to anyone, whether you're a football fan or not! Personally, I don't think the Stadium Tour Plus is worth the extra money, as the Virtual Reality only lasted 5 minutes and simply showed a few historic football matches. I feel I would have had the same experience watching it on a normal screen. However the audioguide was informative and taught me more than I would have learnt without it. To conclude, I would recommend purchasing the Stadium Tour, as you will get the same experience for less money. Everything you see in the museum has a description next to it anyway, so you won't be missing out on much by not having the audioguide. Don't stop there, check out Leo Messi's house! If you're interested in the Camp Nou tour and the professional lives of the players, you'll probably be interested in their personal lives too. I have written an extensive article about Messi's house, including where he lives with a detailed description of his mansion, a house tour, photos of the house and much more! Lionel Messi’s House Sarah Bakewell 16 Mar 2018 Have you ever wondered where this global superstar lives? Read this article to find out! If you want to attend a match at Camp Nou, you’ll need to buy a ticket. You can purchase them on the official FC Barcelona website. Prices can vary depending on the type of match and the team Barcelona are playing against. If you want a cheaper ticket, it’s advisable to book in advance! If season ticket holders decide not to attend a match, the seat is then released to the general public, so if you’re lucky, you can buy cheap tickets for 50% of the purchase price! This forum talks about this in more detail, along with the best seats to watch the match. You can also read this forum for more opinions about the best seats to choose when purchasing your ticket. Prices can vary greatly, with some matches costing just 10 € and others costing 1000 €! The cheaper matches are always between October and February. The most expensive months are the months of May and August, as these are when big decisive matches take place and when the new team is revealed. There are lots of different things to take into account when choosing your seat. You need to consider the view, the atmosphere in each area and the price. No matter where you choose to seat, you can rest assured that you're going to get a good view of the field. Of course, if you're higher up, you will get a good view of the whole pitch, however you won't be able to see the players as well. The higher up you go, the cheaper it is. For more information about going to see a match at Camp Nou, you should read the following article. 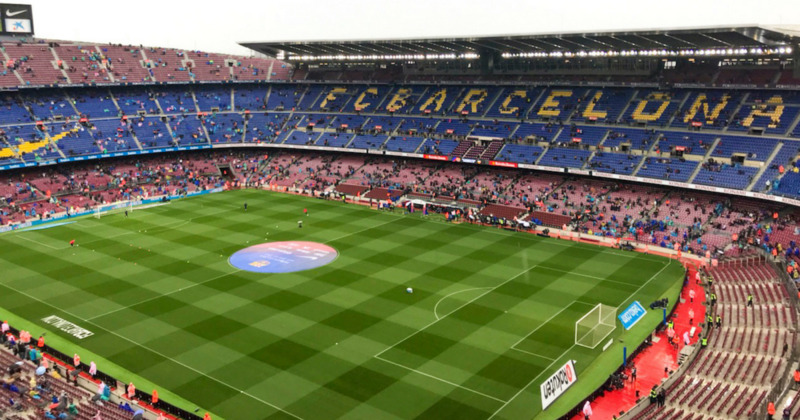 Guide to see a match at Camp Nou Simon Leroy 23 May 2017 This is what you should know before going to see a match of Barca at Camp Nou to fully enjoy it. If you're heading towards Gol Nord, take the metro to either Maria Cristina, Les Corts or Palau Reial (green line, L3) and head down the hill. If you're going to Gol Sud, stop at Collblanc or Badal (blue line, L5), as these are closer. These metro stations all surround the stadium, so don't worry if you miss your stop, you can just get off at the next one! Take route T1, T2 or T3 and stop at either Pius XII or Palau Reial. Be warned though, the tram can get very busy on match days. There are lots of buses that will take you to Camp Nou. Take either number 7, H8, 15, 33, 43, 56, 63, 67, 68, 70, 72, 74, 75, 78, 113, 153, 157, 158 or 167. You can also reach the stadium on the Barcelona Bus Turístic, although this takes a lot longer. You could also travel by car as there is parking at Camp Nou. On game day, parking spaces are reserved for club members. In the following article, you can take a look at all the places in the city where you can park for free. The closest place to park would be around Zona Universitària and Palau Reial. This is a popular spot however, so if you cross Diagonal, you can try parking along Carrer Martí i Franques. Where to park for free in Barcelona? Martina Vitali 05 Aug 2015 Useful tips and places to park for free in Barcelona. Nou Camp or Camp Nou? Camp Nou or Nou Camp? In Catalan, ‘nou’ (new) can go before or after ‘ ground’ (camp), so both were technically correct. Both names were actually correct until 2001. President Joan Gaspart called a referendum among the club members to decide which name to use, in which 68.25% voted to make Camp Nou the official name of the stadium. When the ground was first built, there were plans in place for the ground to be named after Joan Gamper, who founded the club. However, due to his association with Catalan nationalism, the Francoist authorities opposed this, leading to the unimaginative name ‘Estadio del FC Barcelona’ or FC Barcelona Stadium. However, many supporters continued to refer to the stadium the ‘new ground’ after the former stadium at Les Corts. The pronunciation of Camp Nou has caused many difficulties for many foreigners as the sound is unnatural in the English language. ‘Camp’ is more or less pronounced the same way we would pronounce it in English, although sometimes Catalans will drop the ‘p’ at the end of the word to make it ‘cam’.Trying to pronounce ‘nou’ is the tricky part. Many people pronounce it as noo or now. You can get away with using these pronunciations, however the correct way to pronounce it is by making the ‘o’ sound (like in hot) with a ‘u’ at the end. A close equivalent in English would be ‘know’. If you want to hear how a native pronounces it, click here. Camp Nou is one of the most popular tourist attractions in Barcelona. Considering how many popular tourist attractions there are in the Catalan capital, it shows how intertwined football has become with the city. Now that the club has paid off its debts, it can finally afford to renovate the venue. The club have invested €360m (£318m) into Camp Nou which is part of a larger €600m (£530m) project called Espai Barça. The project is scheduled to be completed for the 2022-23 season. Originally, the club considered moving to a different location, however the effect on the 85,000 season ticket holders was too great so they decided to renovate the 60 year old stadium instead. The Wi-Fi will be improved to support the increasing number of spectators who are using it, improvements in the VIP hospitality services and 6,000 more seats will be added. The parking area will be removed to improve access for fans and a new car park will be constructed underground. Additionally, the first tier of the stadium will be made more vertical which will improve visibility. Outdoor terraces will be installed around the perimeter of the building on each level to encourage fans to stay longer and to offer more than just a football, but rather a Catalan experience. The capactiy of Camp Nou is 99,354 seats. When the stadium was originally built, it was designed to hold 90,000 people, 30,000 more than the previous stadium. In 1980, the stadium was extended to the upper rank for the Football World Cup which took place in 1982 thus the stadium had more than 120,000 seats. However, the Union of European Football Associations (UEFA) imposed restrictions which meant that the number of seats was reduced. The addition of the third tier for the 1982 World Cup. A new first tier in 1994. The stadium’s maximum height is 48 metres (250 m x 220m), covering a surface area of 55,000 m2. However, due to the restrictions set by UEFA, the field size at Camp Nou was reduced to 105m x 68m which is covered by GrassMaster hybrid grass. There are 23 executive suites. Originally, the club played in numerous grounds until eventually, they found a permanent home at Camp de Les Corts, which was opened on 20 May 1922 with a friendly between Barcelona and Saint Mirren, a team from Scotland. The stadium had a capacity of 22,000 people, however it had to be remodelled several times to make room for the clubs growing fan base. On 24 June 1925, Les Corts became a symbol of the Catalan resistance towards the central government. Barcelona had organised a match in homage to Catalan organisation Orfeón Catalán, a choral choir based in the Catalan capital. Initially, the authorities refused to grant permission for the match but were forced to cave when large crowds of spectators turned up. However, as soon as the Spanish national anthem was played, the crowd started booing and jeering, angering the Spanish authorities. This led the authorities to close the stadium for a period of six months, which was later reduced to three months. Despite several expansions, the ground simply wasn’t big enough, so they decided to build a new ground. On 21 April 1957, Barcelona played their last match in the Les Corts stadium against Sevilla resulting in a 1-1 draw. In 1966, the stadium was finally demolished. Parc de Les Corts now sits on the site where the stadium once stood. After many discussions among the commission, the first stone of Camp Nou was laid in front of a crowd of 60,000 fans on 28 March 1954. The stadium was designed by Francesc Mitjans i Miró and Josep Soteras Mauri. The building work was undertaken by Ingar SA. The club finally opened on 24 September 1957, the Día de la Mercè, the patron saint of Barcelona. The whole city was decorated in Barcelona colours (blue, maroon and red). A mess was held and the stadium was blessed by the Archbishop of Barcelona, Gregorio Modrego. Despite the stadium being unfinished, more than 90,000 fans, including Franco ministers, turned up to witness the historic event. Representatives from all the major football clubs in Catalonia paraded on the pitch with members of other sports teams and supporters. The new stadium anthem was performed before the first match in the new stadium kicked off against Polish side Warsaw. During half time, the Agrupación Cultural Folclórica de Barcelona danced a sardana, a circle dance typical of Catalonia. Afterwards, 10,000 doves were released. This restaurant offers top quality tapas approved by Michelin starred chef Carles Abellan. The restaurant has two screens to watch live matches on, as well as fussball tables. You will find traditional dishes such as patatas bravas, meatballs. Russian salad, sandwiches, octopus and more. The bar is open from 9am until 11pm every day and will stay open for longer on match days. There are two large terraces and members get 5% off the bill. This bar is located within the Camp Nou Experience inside the stadium. This area serves beer and snacks on a spectacular terrace. This restaurants serves freshly made sandwiches and has a comfortable outdoor seating area. The restaurant is located next to access 9. If you are coming to see a match at Camp Nou you should check the accommodation options in nearby area: "Les Corts". This is an area of high standing where the holiday apartments are not too expensive. An apartment is always more economical than a hotel and if you travel in group, the price per person is even lower. When you book your holiday apartment, I recommend that you analyse its value for money. There is a big offer of vacation rentals in Barcelona. Download an impressive Camp Nou wallpaper for your desktop here.